Well I'm not a big complainer and I would consider myself and my family very friendly, so here goes. We started our holiday having booked what I thought would be a basic Greek two bed appartment. What a surprise when I was given the key to a studio with hand made and unsafe steps going up to an attic room with no window!! Don't get me wrong it was clean and basic but the upstairs worried me a bit as there was no fire escape so I asked for another room and was told no. Staying here in the middle of August was obviously extremely hot so we paid for air conditioning which didn't work, I reported it straight away and it took 4 people and 4 days to finally get it working and to top it off I was expected to pay for it whilst it was not in use. This I refused to do and finally won my argument with the help of Mel on reception. The airconditioning didn't reach the room upstairs so my teenage kids had to bunk on the floor downstairs in the studio. The staff were ignorant and unwelcoming which drove us elsewhere to eat and drink and only used the room for sleeping. We used the facilities at the Alykanas Beach Hotel which were far better and the staff much more friendly and we had a great time. I will be returning to Alykanas next year but will not be staying at the Letsos, even the locals think it's crap. Alykanas Beach here we come!!!!!!!!!!!! My family and I have been going to the Letsos now for the last 5 years, sometimes twice a year. Great place to stay central for everything. 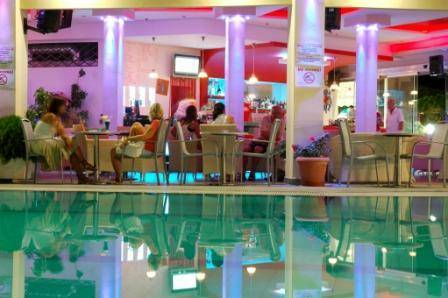 Loads of restaurants and bars - check out the Jammin bar and the Ammos bar on the beach - Good times! 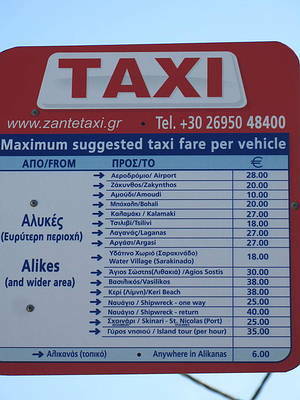 Last year we were paying around 1.50 - 2.00 Euros for a beer. Plenty of meal deals about where you get your beer/wine thrown in. I would budget about �350 - �400 for a week, maybe have a little bit put by for back up. Remember too the Eleni does the best breakfast for around �4.50 Full English with toast and a hot drink or juice. You will not be disappointed. also is it expensive or cheap there? 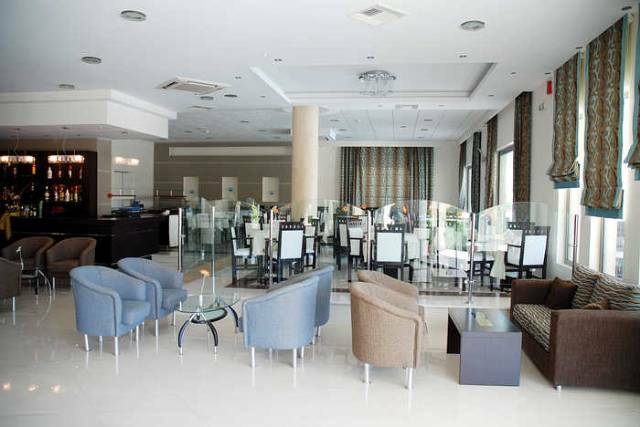 Booked a last minute deal through Thomas Cook 14th - 21st of October with 7 nights stay at Hotel Letsos in Alykanas. After reading the reviews i was dreading it. How wrong could they be. The hotel was basic, but you get what you pay for. Staff were helpful and no problems with the room. Food was some of the best i have ever tasted and if you ever fancy a chinwag then pop over to the Stonebridge Cafe across the road and while your there try the Stonebridge breakfast. Full english, toast and jam, orange juice and unlimited tea or coffee for 5.50 euro. As for the travel company, they were brilliant. The rep lives directly across from the hotel, times for tranfers are posted without fail on the board at reception. Ok the island doesn't offer as much as places like Ibiza and does look, in places, like it still isn't finished, but don't let this deter you. Locals are friendly and always happy to help. Returning next year with the kids as me and the missus enjoyed it so much. Just been on holiday to Letsos for 2 weeks. Fantastic holiday on a beautiful island. After reading reviews we were concerned what the hotel would be like. But they were wrong. A very clean hotel with exteremly friendly staff. Mel on reception was fantastic and knew lots about the area, e.g. 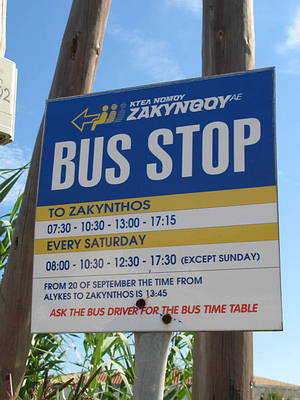 bus times. The room was exteremly clean with fresh towels every two days and the bedding changed 3 times in two weeks. Maid cleaned every day. The bathroom was good, like a wet room even though there was a shower tray. The facilities for cooking were basic - but Thomas Cook had told us this on booking. Could of done with a toaster! Some people were complaining about the charge for air conditioning but again Thomas Cook had advised about this on booking. 100 euro for two weeks and 30 euros for a safe for the two weeks. Special offer tours directly across from the hotel was good for trips. Reasonable and tour guide had a good knowledge of the island. The resturants are excellent with Apollo being one of our favourites. The Stone Bridge cafe across the road from Letsos was good for snacks. 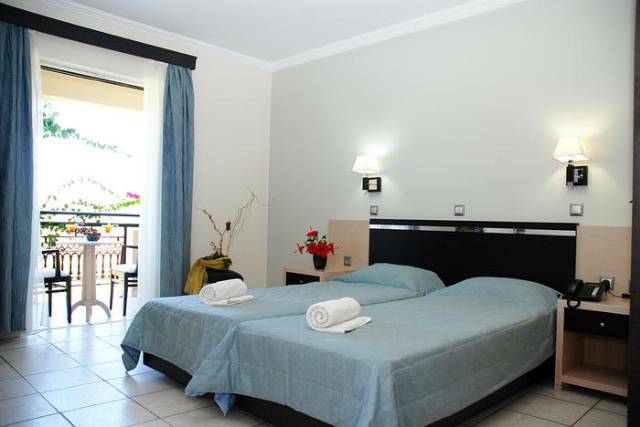 We would recommend people trying this hotel and the beautiful island of zante. We will return in the future. For sure a worst experience ever. I was holidaying there July 2009. After reading reviews, friend and I booked 2 weeks, but we insisted to have a room in the newer part of hotel. Unfortunately, when we arrived we realized that we are in old part and that there was no way to change it. We didn�t use kitchen because we love "benefits of self catering�, but to prepare a dissent meal in that kitchen? I dont think it�s possible. Plus the refrigerator was leaking all the time, I was scared not to get electrified. But the main problem was water. First several days we had no hot water. After several visits to the owner�s wife, we got the hot water, but then there was ONLY hot. We had no cold or mild!!!! So put yourself on sun all day long and then to the hot shower� It was horrible, but the owners didn�t care to call the plumber again, so the last 4 days we just stopped complaining. Second was the noise. We had a room with the pool view and it was incredibly noisy. There where 2 fountains, one in center of the pool and one just under our windows, so it sounded like Niagara Falls. Plus the owner�s son is some kind of DJ, and when he gets company of young girls, the result is very loud music till 2-3 am sometimes. Very unprofessional. The result was that for 3 nights because of the noise, we just had to close both window layers. That much about breathing nice Greek sea air. Alykanas and Alykes are nice, Zakynthos is beautiful, fun, fresh and positive and with a rented car you can have a time of your life. But Letsos is a low budget, not funny horror movie. My personal attitude is that tourist association Greece should get involved there, it�s a shame what those people are doing to the tourists. Outside, the hotel looks really lovely. Unfortunately, the inside isn't quite up to scratch. Rooms basic, bed very uncomfortable, bathroom flooded after the shower being on 30 seconds, severe lack of towels, doors banging from 08.00 hrs. Odour in the hallway. Pool bar is nice and the hotel is in a good location, but the standard of room lets it down, and we would not return again. But the Letsos is delightful. It has been heavily invested in since our last visit in 2006 and many rooms now feature a shower cubicle, rather than a drain in the floor of a "wet room" bathroom, plus the luxuries of brand new fridges and the like. 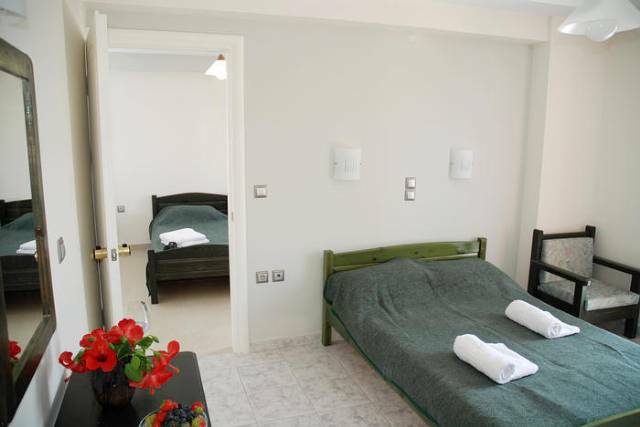 The rooms are fairly basic, but wonderfully clean and certainly comfortable enough. Sheets were changed 3 times in our fortnight's stay and maid service was 6 days per week as advertised. Just got back from Alykanas, stayed for three weeks The Hotel was very nice from the outside but inside was a different story The room was clean when we turned up, BUT in the three weeks we stayed they didnt clean the toilet or sink, we didnt have hot water most of the time, the sheets were only changed once a week. We were b&b, the breakfast was awful (ok if you liked tomatoes) the juice was watered down, the chese & ham curled up, (no fruit) & the milk was warm. Me and my friends stayed at Letsos this June. It was a good enough hotel only if you go self catering its pretty much a joke, no toaster, no oven, no kettle, no microwave...only 2 rubbish hob spots . Shower didnt work properly had to hold it or it sprayed the whole bathroom, walls are paper- thin also. Pool was always nice and clean and it it perfectly close to the bars, beach and supermarket. Very basic but nicely situated. Have just returned from a fortnites stay in Alykanas again. This is our 5th visit and 3rd stay at the Letsos. Rooms basic but ok if you do not plan to stay in them all day. Get the aircon - bit pricey but you will need it in the Summer! Towels and bedding changed everey 3 days. Remember that the showers in Greece always leak over the floor that's why there is a drain in the middle!! - Hello to Heleni, Maria, big Denis and little Denis - Don't get tricked by the footie trick in the bar!! Short walk to the beach and all the great bars and restaurants. Worth a walk along the beach to the restaurant Naraida - they give you free wine and the food is fab and very reasonable!. Over the road to a fab bar called Jammin Bar - Hi Sakis! Best music on the island. The Millenium Pool Bar is at the other end of the main road but also worth a visit - fab swimming pool and great free facillities (Hi to Steph and Joe and the two most handsome barmen in Zakynthos!) Will see you all again next year!! My friends ane I have been staying at the Letsos for over 5 years. It is the best place out the staff are fantastic we have many friends that return year after year. We will be back in July. I think the hotel is great I know all the family especially dennis and little dennis elani and Maria what a great hotel to stay at pelenty of people to talk to and many wondeful times I have had there I am flying out in may and staying out there for 4 months and will be visting the family they are great and would do anything to please the tourists who stay there and the bars and facilities around the hotel are fantastic I never had any problems whatsoever. i stayed at letsos hotel with my family, and it was the best holiday ever, we were at the bar every night with good old dennis always making us laugh and entertaining us, hopefully we will be back next year, and what a small worlds turns out a girl in one of my classes has been there aswell, jim and the bar, Mika, everytime i listen to his songs just reminds me of you. HELLO LETSOS and dennis haha X. Wonderful location somewhat let down by the very basic accomodation in need of maintenance on the rooms. We had broken light in the bathroom, no shower head holder, shower door at fault and a loo that required plumbing instructions when used. There was no TV supplied as advertised (despite asking for one). We had one towel each for the week and the cleaning left something to be desired. The manageress was friendly and worked hard but what they need is a good maintenance man and an efficient cleaning system. I've just returned from 2 weeks at Letsos. Unfortunately the hotel is very basic and the room we had was tiny. For self catering accomodation the facilities are rubbish and because it was so small you could almost sit on the toilet and open the fridge!! 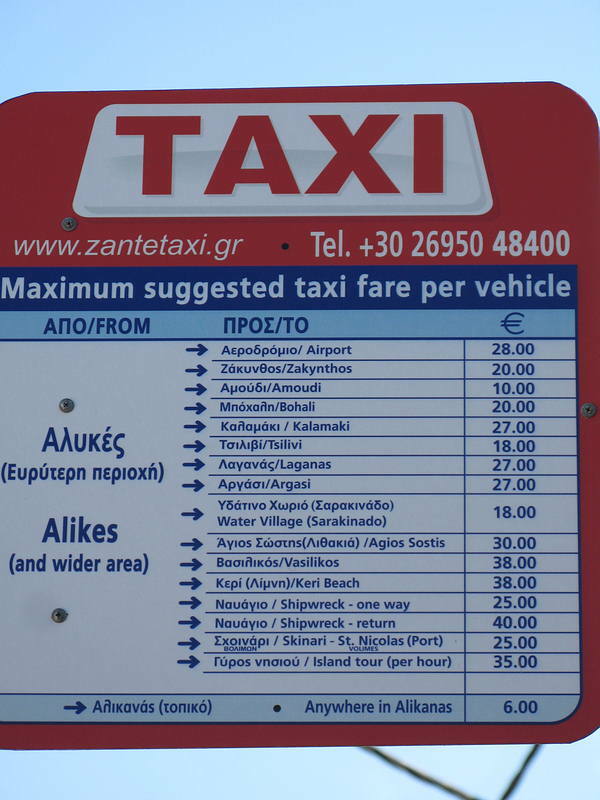 I loved Alykanas and would definitely go back but would not stay at Letsos. The rooms are outdated and the whole place needs a good refurb! Apart from the mum and the young lad Dennis we found the staff quite rude and unhelpful. I don't know whether this was because we are quite a young couple because they seemed to only care about the older residents. When we first got there the shower had no head on it (it was just like a hose pipe), we got this fixed but the shower was still really bad and leaked all over the floor every night- because of this our towels were soaked every night as we had to mop the floor but they were only changed twice in the 2 weeks! The noise is also really bad as the floors and walls must be paper thin. Every morning we were woken up by somebody above us who sounded like they were doing a tap dance in platform heels!! !I will say that the hotel is in a really good location near to the beach and the town but I would rather stay further out than stay here again. Thanks a lot for getting back to me, much appreciated! As I've already said we've stayed at the Letsos in a self catering apartment and it was absolutely fine. Didn't use the cooking facilities as there are so many good places to eat at very reasonable prices. If you have any worries or concerns once you are there speak to Eleni and I'm sure she will do everything she can to sort them out. We found our stay there to be very comfortable and relaxing. Please don't worry you will have a wonderful holiday and hopefully like us will keep returning. If you need any further information just ask. We stayed at the Letsos last year august 2006 for one week it is basic but we had a wonderfull time everyone is so freindly and helpfull the owners are wonderfull they really make you feel at home. I have stayed at the Letsos and have no complaints whatsoever. Yes the rooms are basic but of a good size. Our bathroom was very nice with constant hot water. The room was clean so was the bed linen and towels. The family who run the hotel are extremely helpful and will go out of their way to make sure you enjoy your stay.